What Should I Do If Bitten By A Black Widow? Black widow spiders are famous for their shiny black bodies and telltale red hourglass marking on their underside. If you live in or near Mesa, you have probably seen a black widow at some point in your life since they thrive in our desert climate. What we hope you or your family never has to deal with is a black widow bite, because they can cause some painful or life threatening side effects. If you don’t know the signs or treatment for a black widow bite we’ve listed some helpful hints here so you can be prepared if a situation ever arises! What Are the Signs of a Black Widow Bite? You feel a pinprick sensation followed by redness and swelling at that site – this is called the bite site. If possible, carefully scoop up the spider in a plastic bag if you catch it in the act or even if you have stomped on it, so that you can take it to the doctor and properly identify what type of spider bite you have. If you don’t feel the bite but have pain and swelling at a localized site on your skin, followed by muscle cramps in your stomach or shoulders then your body is reacting to a bite. Headache, nausea, dizziness and chest pain are also symptoms of a black widow bite but can be signs of other medical problems as well so it is always important to go to the doctor and get a medical diagnosis. What is the Best Treatment for a Black Widow Bite? As mentioned above, every person reacts differently to black widow bites so the treatment will match the severity of the symptoms. If you don’t feel much discomfort other than some redness and swelling that goes away within a day or so, your doctor may not recommend much treatment. As long as you keep the spider bite clean and no signs of infection occur, then you are one of the lucky ones that has a very mild reaction. On the other hand, if you have muscle spasms, chest pain or feel dizzy then you need to go to the hospital right away as there may be medications, including antivenin, that you will need to help your body recover from the black widow bite. Younger children or people with heart conditions or other medical conditions also need to be treated immediately so that a doctor can evaluate the symptoms and provide the best treatment options. How Can I Prevent Black Widows from Infesting My Home? The best way to avoid a black widow bite from happening is to prevent black widows from being in or around your home in the first place! This includes wiping out their food source of other bugs by having regular pest control maintenance. Plus, these spiders prefer dark, undisturbed areas to live and breed. So you can help do your part by keeping closets, laundry rooms, storage sheds and garages clean and free of debris and clutter. We also have some myths and facts about black widows if you want to educate yourself a little more about these spiders and how to best prevent them. 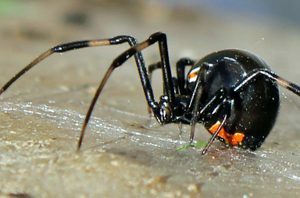 As always, we hope you feel a little more knowledgeable about these pesky spiders and if you find one or many black widows in or around your home we can help! Please don’t wait until someone is bitten to treat your home or yard. Feel free to call us anytime so we can inspect and discuss your pest control needs.